Serendipity smiled down on me. I’ve been so busy with holiday nonsense that I haven’t had time to watch movies much the last few weeks. I actually have owned this movie, Ye Maaya Chesave (What Magic Have You Done — a very appropriate title) for months. I bought it in a DVD bundle when I took a chance on a Bhavani DVD order. Another movie in the bundle, starring Nagarjuna in King, I did not like that much and this other DVD got pushed to the back of the pile. I was looking for something else this week and came upon it. When I ordered it, I did not know either actor in that front cover pic, but they sure look familiar to me now! I will tell you straight out that both leads show that this is an early film. There’s sort of a fidgeting to some scenes like they don’t quite know what to do with themselves — they don’t yet have that confident screen presence they do now. But there are a few scenes that are just pure magic! The awkwardness and how young they look fit with the characters. Poor Chaitanya has got acne, and Samantha is so baby-faced! The movie starts in a church and Jessie (Samantha Prabhu) is the bride, and Karthik (Chaitanya) is sitting in the pews with his head in his hand. “Why did I have to fall in love with Jessie?” And, flashback for half the movie. Real life director, Puri Jagannadh (Pokiri), cameos as the director on whose film Karthik finally gets a job as an assistant director. There are many twists to the story. Karthik is a jerk and needs to grow up in the worst way. Jessie needs to get a spine at moments, but then does so in spectacular fashion. It’s one of those movies that feels both like a real complicated relationship, and also so filmi with moments for love songs that just sweep you away. The ending is just filmi swoon inducing. I had to play the last 10 minutes all over again when I finished because this one speech of Karthik’s at the end — just the best. The music is all A R. Rahman and is an awesome soundtrack. This director films his movies in Tamil and Telugu at the same time — but with different casts. I was absolutely tickled at the exotic locale for this fantasy song when he’s first falling — Princeton!! Thanks to this film, I now have maybe my all time favorite line in an Indian movie. When the two lead characters meet in Central Park in NYC, they hug and then the guy says, “This is America! I can kiss you in the middle of the road!” And he does, repeatedly. So glad I own this one but I found the whole thing is on Youtube with subs! Janatha Garage (I think it translates to People’s Garage) is writer/director Koratala Siva’s third feature film, and his first collaboration with Jr. NTR. I loved Siva’s previous blockbuster films, Srimanthudu with Mahesh Babu and one of my favorite Prabhas films, the fantastic Mirchi. Malayalam superstar Mohanlal returns to Telugu films after a cameo appearance 2 decades ago. Janatha Garage was filmed in both Malayalam and Telugu, and released in both languages. I find it really interesting the cross promotion, because the film also includes Malayalam star Nithya Menen as the second heroine, in her first collaboration with NTR. Samantha Prabhu is the first love interest, a star in Telugu and Tamil Cinema. The first half of the film chronicles the creation of Janatha Garage (the people’s garage). Mohanlal not only fixes cars, but he fixes the problem of anyone who comes to him. When his brother and his wife are killed by one of their enemies, Mohanlal gives the orphan infant to the mother’s family saying that he will have nothing to do with the boy, as they wish. And as young Anand grows up, his family don’t even have a picture of his father in the house. They just tell him his parents died in an accident. Anand (NTR’s) love interest is his cousin (Samantha Prabhu) and that was a little squicky for me because it seemed like they’d been raised as sister and brother. He meets Nithya Menen early in the film – and scolds her for things like setting off firecrackers for Diwali creating air pollution. Nithya becomes part of the group of friends with NTR and Samantha. One of my two favorite songs is NTR with Samantha in the Apple Beauty love song. He’s really fantastic dancing in this one. Anand goes to Hyderabad to study Environmental Science, and has a run in with Mohan Lal’s son who has joined forces with the family enemy, the evil developer. NTR hears about Janatha Garage, and Mohanlal hears about his good deeds. Rather than confront him for the dust up with Mohanlal’s son, he asks NTR to join the Janatha Garage to carry on his work. Mohanlal had been in an “accident” and the doctors had warned his family that he should stop and not have stress. Neither realize that they are nephew and uncle. But they have a natural affinity. They both just want to help people. In Hebrew, we’d call it Tikkun Olam – Repairing the World, which encompasses the environment and good deeds. It’s just that NTR knocks heads together to fix things as well as plants trees. One of the best fight sequences has NTR coming to the aid of a government clerk who is ready to commit suicide rather than sign off on shoddy plans for a hospital. The builder has threatened his family, and he comes to the Janatha Garage for help. He’d been turned away by the others at the garage after Mohanlal got out of the hospital, but NTR resurrects the true mission of the garage by helping him out — and inspiring his co-workers to view the clerk as the true hero. Koratala Siva has set up an emotional family drama to punctuate the action. Mohanlal has the son who rejects his way of life and joins the enemy camp. He also has the son of his heart, NTR, who he doesn’t even know is his true long lost nephew. And there is a very dramatic scene when Anand’s family finds him at the Garage, and forces him to choose the girl he loves or Janatha Garage. The songs are mostly very good, and NTR’s dancing is great. Kajal has a really fun item number in the second half — the very catchy Pakka Local (Strictly local girl). Jr. NTR has lots of charisma and screen presence, and his dancing and fight scenes are great. NTR is looking much more fit than his Yamadonga days, but he’s not as playful as he was in that film. Srimanthudu had more moments of levity than does Janatha Garage. Mohanlal is predictably excellent as the sort of do-gooder don of Hyderabad, with tough fights in the first half, and anguish over his wayward son in the second half. One thing that could have been better is the villain is more smarmy than scary. The romance elements are not the focus of the film at all, and take a back seat to the male family relationships and the action. An enjoyable flick, even if it dragged a bit in parts, and especially fun to see Mohanlal and Jr. NTR act together. They make a perfect pair. I have just recently discovered Mahesh Babu, and I was really excited to be able to see my first Mahesh Babu film on the big screen. I have been listening to the Brahmotsavam soundtrack non-stop, especially Vacchindi Kada Avakasam, the first song in the movie. The full song sequence did not disappoint! I have very mixed feelings about the movie. The songs and the soundtrack are GREAT. I mean, I saw a movie with an A. R. Rahman soundtrack this week that didn’t impress me half as much (the Tamil Sci-fi 24)! And the song number sequences were amazing. The dancing, everything. I’m going to be downloading most of the soundtrack. Vachhindi Kada Avakasam is still my favorite, but the title track and several other songs are fantastic. I felt like this was one of those movies where they assembled all the actors, but didn’t really have a script. I can hear the pitch to Mahesh – It will be about family! Two romances with your romantic leads from other films! Great location shots all over India! Scenic! Gorgeous! Great music! And….. then the plot was an afterthought. I have not seen Seethamma Vakitlo Sirimalle Chettu, writer/director Srikanth Addala‘s previous hit film with Mahesh Babu. Three Indian guys after the movie told me that one is much better, and one I should definitely see. Brahmotsavam (which I think means grand celebration) is very much like the Hindi classic family films Hum Aapke Hain Kaun (HAHK) and Hum Saath Saath Hain (HSSH). Not a lot of plot. Lots of family. The drama, such as it is, is that the Sathyaraj, father of Mahesh, loves big celebrations and family gatherings. He is wealthy and has a paint company that he started with 400 rupees given to him by his wife’s family. His brothers work for him at the company. But there is one brother-in-law who is bitter and resentful. And this is where the non-specific relationship names in the subtitles were tripping me up. When Mahesh called the mean uncle, “uncle”, it could have been because he was his father’s partner and it took me quite awhile to figure out that he WAS a family uncle. I don’t know the Telugu terms as well as I do the Hindi yet. Mean uncle wants Mahesh to marry his daughter. But Mahesh is falling for Kajal who is visiting for the holiday? Her relationship to Mahesh was really unclear. I couldn’t catch if she was a cousin, her father’s relationship to Mahesh’s father I couldn’t figure out. I think she was the daughter of a family friend. I was very, very confused. We have this “wedding scene’ which I later figured out was a holiday ritual. Family on two sides of a room with a god/goddess statue at the center front. And the family members argue in turn like they are arranging the marriage of the gods. “What’s this about this Radha we’ve heard about?? Will the groom be faithful?” Banter like that. The scene is repeated later in the movie which is when I finally figured it out. The first time I literally could not tell if they were arguing and arranging Mahesh’s marriage or his sister’s or WHAT the heck was going on. It was a scene I have never seen in an Indian movie before, but I haven’t seen very many Southern Telugu films. What was good in the film were the two romances with Mahesh. The first is with Kajal, and their teasing flirtation, and couple of songs were fantastic. This song made me swoon. She goes on a big family trip with Mahesh’s family, which reminded me very much of the family trip scenes in Hum Saath Saath Hain. Cue GORGEOUS scenery. There was a family argument with mean uncle and Mahesh’s father — and then this super weird confusing scene where Mahesh is consoling his despondent father. And it turns into like a nightmare dream state and Mahesh is running around the house — and the father is dead? I mean it was not obvious, and it took me awhile of dialogue after that to figure it out! The subtitles might have not served me well, but it was damned confusing. It was a missed opportunity for drama, in my opinion. So now Mahesh is lonely, his uncle won’t reconcile, and Kajal left him. Enter Samantha, a friend of his sister’s in London! She comes to the house in a very funny scene, introducing herself as the sister’s friend and can she stay. Sure! Um, can I bring in to stay some friends I met on the way? Sure! An entire BUSLOAD of people come into the house!! It was very amusing. Samantha Prabhu was in the Tamil film 24 I saw earlier this week, and she was better here, but not exceptional. She is the life and brightness that Mahesh needed. She obviously loves having more and more family and people around, which is just what he likes. For some unknown reason, he brings her with him on a quest to find “the generations” — his roots and to meet all his distant relatives. This leads to traveling ALL OVER INDIA finding distant cousins, Nasser is one, and other recognizable character actors. This part was super super confusing to me. The cities visited were stunning and gorgeous, but it was hard to tell why they went all those places. And at the end he invites them all to his uncle’s daughter’s wedding, thus showing respect?? And they reconcile and Mahesh begs to live in his uncle’s house. Wha??? What really, really irked me was that when Kajal breaks up with Mahesh, she kisses him and hugs him. Mean uncle sees this and leaves the family trip in a huff — because he had wanted his daughter to marry Mahesh. He doesn’t know that Kajal was breaking it off. Now, what happens next was confusing in the movie, but I think he beat his own daughter. And Mahesh goes to the hospital and the daughter tells Mahesh that her father (mean Uncle) was upset when he saw the Kajal kiss. She has bruises all over one arm, and her ankle is being bandaged. So the whole movie Mahesh is trying to reconcile with the mean uncle. He is not ostracized for harming his daughter. He arranges a good marriage for her at the end– I’m not sure we ever saw the groom, and frankly up till the end I couldn’t tell if Mahesh was the groom and was giving up Samantha to patch up the family. It was that confusing! But I know this is all “Indian family values” like in HAHK, but I was really bothered about it as I’ve been thinking it over in the hours since I left the theater. WHY should family harmony trump all, and there be no backlash for the daughter beating. It rankles me that Mahesh felt he needed to literally bow down to this uncle to make peace. And Mahesh has a sister we see on video chat, but she doesn’t ever reappear even after the father’s death. Another missed opportunity for drama. I was so confused at the end! As I walked out of the theater three young men stopped me and asked how I liked it, and I admitted that I was confused but loved the soundtrack. And they said it was all about connecting to the generations at an Indian wedding, but they agreed that the plot was confusing to them, too. That made me feel somewhat better because I thought it was just me, and my ignorance of the Telugu language and the Southern rituals and all. But these three guys said the plot was not the best for them either. Brahmotsavam was a big letdown for me. This movie was not as great as I was hoping it would be. I will read up on what the heck the plot was about, and then go back to see it again when the prices are lower. (It was $18 for the opening day.) I did love the song sequences a lot, and would like to see them again on the big screen. The colors, the scenery, the chemistry with Kajal, the music, were all fantastic. It’s just really a shame that there wasn’t a worthy enough plot and drama to hold it all together. I contrast this to Kapoor and Sons which was such a fantastic family drama with a stellar script. I shouldn’t have to come out of a movie and then go online to figure out what the plot was that I just saw! I give Brahmotsavam two and a half stars out of five, mainly for the music alone and the romance with Kajal. Sci-fi films are not that common in Indian Cinema at all. (I still haven’t seen Rajnikanth’s Robot which is sitting in my DVD pile.) 24 was a really interesting film, because it used some of the conventions of sci-fi films I’m used to from the West, but added in the family and mythic elements of Indian cinema. The film stars Suriya in a triple role. This is my first Suriya film. Looking him up later, he is famous for originating the role of the cop in Singam (which Ajay Devgn remade into the Hindi Singham). In the picture above Suriya plays the inventor dad who makes an almost steam punkesque time machine watch. It can only go backwards a maximum of 24 hours, thus the movie title. The middle character is the evil brother of the inventor — very Indian! Then the left is the 26 year old son of the inventor, present day 2016 Mani. Nithya Menon of OK Kanmani has a brief role as Priya, wife of inventor, mother of Mani. Samantha Prabhu played the love interest for Mani and was just okay. Suriya was impressive. He is a talented actor because he really, really pulled off three separate characters with the three roles. And there are scenes of him being one character and pretending to be another which is hard to do, and he totally nailed it. There’s a whole plot with baby Mani being entrusted to a young girl who raises him on her own as a single mother. I’m thinking there’s a whole Mahabharata story I’m missing that it ties to that would be obvious to the Tamil audience. (Asked a friend and the foster mother is supposed to be Yashoda who raised Krishna.) There’s also elements of karma and fate as the time travel machine watch and a key find their way to Mani. What was great about the film is that when Mani gets the time travel machine watch to work (he’s a watch repair man, fortuitously! ), he first uses it to romance the girl. He’s almost like a young superhero geeking out over his new found super powers. Those scenes were really fun. He can also freeze time, and uses that to take a selfie with Dhoni in the middle of a cricket match. Watching him explore the powers of the time travel machine, explains what it can do, and how the time travel is going to work (and its limits) to the audience in a clever way. I really love time travel movies, especially when they are used in romantic films. 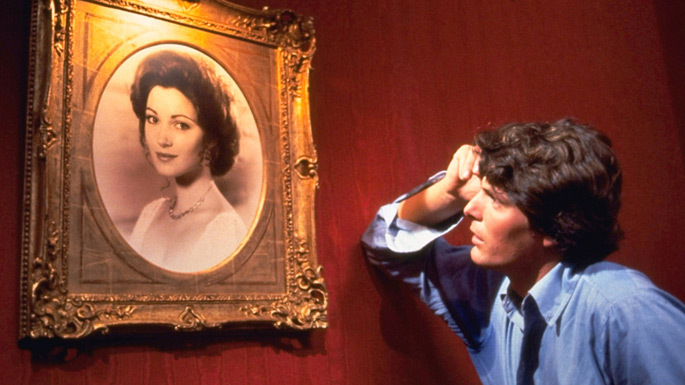 Outlander is hot right now, but who can forget Christopher Reeve in Somewhere In Time? He had no time machine, just hypnosis and the power of his love! There have been several adaptations of H. G. Wells novel The Time Machine, notably the 2002 The Time Machine directed by Simon Wells, great-grandson of the author and starring Guy Pearce. In The Time Machine, Wells or his avatar finds love with a primitive girl as civilization has collapsed in the distant future. Yeah, there’s none of that kind of nonsense in 24, thankfully. It’s a story of personal revenge in one family. But while Suriya was great as the villain, hell bent to get the time machine watch to try to cure himself — it was never explained why he hated his inventor twin so much. I wish a little less time had been spent on the romance plot towards the end, and some time had been given to the back story of the twin brothers. Of course, the filmmakers have left it open to a prequel or a sequel. I thought the CGi and special effects were good, and the music was by A.R. Rahman. Not his best score ever, and I’m not running out to download the songs, but good. I would hesitate to bring very young children to the film as one character gets his hand cut off. Overall, an enjoyable action film, especially for the performance of Suriya in the three roles. Four stars out of five. 24 is out in Tamil, and a dubbed Telugu version. My theater had both. Yesterday, I decided I was totally in the mood for another Mahesh Babu movie. Dookudu had been recommended to me as one of his best, and I tried to find a good copy online. I ended up running to my local library which had a DVD copy. (I love living in an area with a sizeable South Asian community!) My library may not have many Telugu titles, but they have Dookudu! This poster really shows you what Mahesh in Dookudu is all about. Dookudu was translated as aggression, but also as daring. And you can see Mahesh’s cop character is all about attitude. Mahesh just oozes cool and bravado. He has amazing presence on film, and looks great in all those slow motion action striding towards danger kind of scenes. But after watching 1: Nenokkadine, I was hoping with another heroine, I’d get a better romantic subplot, and maybe a sweeter side to Mahesh, too. And Dookudu gave that to me in spades. Puppy dog eyed Mahesh! He’s no Prabhas, who is still my favorite Telugu actor, but he does have that same ability to go from super cool action, to sweetness and comedy. Dookudu is just a super entertaining mass entertainment movie. The best Telugu films I find really excel at melding together great action, great villains, sweet romance, and comedy all rolled into one. And while 1: Nenokkadine felt like theses different parts of the film did not fit together well, here with Dookudu one flows into the other and the comedy gives you a respite from some pretty intense action and drama. Dookudu at its heart is a revenge flick. Prakash Raj plays the near saintly politician father of Mahesh (Ajay). After our short intro to Prakash, we see him struck in a horrific car crash leaving young Ajay alone. Cut to present day with adult Ajay, now a cop in Mumbai, with a cool introduction fight scene. Ajay is on the hunt of Don Nayak played with supreme evilness by Sonu Sood. He’s wearing an ascot for most of the movie, so you know he’s really evil! One nice thing is that with Sonu Sood being 6’2″, Mahesh is also 6’1″ so their final battle truly feels like a fight of equals. On a quest to find a weak link to Nayak’s empire, Ajay and his team follow Nayak’s brother to Istanbul. There one of Ajay’s team tells him his fortune telling grandma says Ajay is about to meet the love of his life. Ajay mistakes Prashanthi (the adorable Samantha Prabhu) for Nayak’s brother’s girlfriend, so from the beginning we have a hate-to-love romantic subplot. Which is one of my favorite romantic tropes. Ajay and his team capture Nayak’s brother which leads to the scene on the rooftops of Istanbul on the poster. With Ajay’s foot on the gangster’s throat, gun pointed at his head while negotiating on the phone with Nayak. After some great Turkey scenery (so pretty!) and adorable romantic scenes with Prashanthi where Ajay continually puts his foot in his mouth, Ajay returns to India. He then gets shocking news. His father is waking up from a 14 year coma! His father did NOT die! Now, here is the part where the film evidently liberally borrows from the German film Goodbye Lenin (which I have not seen). The doctors tell Ajay that his father should be protected from any bad news or distress so that he doesn’t go back into a coma. Usually, I find the comedy uncle bits of Telugu films very annoying and totally unfunny. In films like Darling, you can see Prabhas struggling to not crack up at his antics, and I just don’t get it. But here, he’s woven into the plot as the current owner of the family mansion, that he rents out as a film set. Ajay convinces him that they want to film a reality show with hidden cameras. It’s all an elaborate ruse so that Ajay’s father (Prakash) will think nothing has changed, and that Ajay has taken his MLA seat and followed in his father’s footsteps. Ajay and his team even produce fake television news shows and newspapers, which is from Goodbye Lenin. A Telugu is now the prime minister of India, etc.! Mahesh is great in all these comedy pieces, posing as a film producer, and a participant in a reality show. His engagement to Prashanthi becomes part of the plan to keep his father happy. Can you guess who caused his father’s car accident all those years ago? Yeah, like I said, it’s a revenge flick. The ways that Ajay crafts revenge on each person who harmed his father are actually quite clever, while keeping his father in the dark that he is now a cop. I give Dookudu a solid four stars out of five. Great action, great romance, and great fun. Mahesh is absolutely fantastic in Dookudu, and Samantha Prabhu is great, too. They have wonderful chemistry together. The songs are not exceptional, but pretty good. This one where the lyrics say “My heart is sacrificed on the altar of love”. It’s kind of crazy with the faux Aztek costumes or whatever they are, but so colorful! Yep. I think I’ve convinced myself writing this up, that I’m going to need to own this one on DVD. Because Mahesh in many colors of wedding finery!